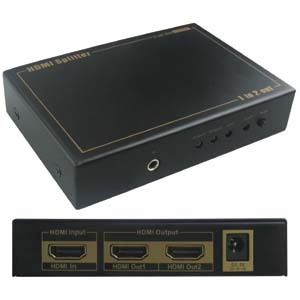 2way HDMI splitter distributes the input of the HDMI signal into 2 outputs simultaneously. Each amplifier splitter's output can achieve long distance transmission of HDMI signal up to 60Ft. IR Extension function allows you to extend remote control IR signal through HDMI cable. Say you have a TV and cable box in the living room, and second TV in the bed room upstairs. You can change cable channel either in the living room or on the bed upstarirs with the cable box remote control. You do not have to go downstairs each time you want to change cable channel.